Holding Custom Elk Bugle #25 donated to Rocky Mountain Elk Foundation. These custom calls are all signed and numbered. Carraway has been in the call business for over 25 years. with instructions and all Carraway hand calls will have a lanyard. patented turkey call. Many of his calls have reeds that are unique to his design. This gives his game calls an advantage over his competition, including better quality sounds, larger variety of sounds, easier to use, less movement while using them, only one hand required, or for some, no hands required. very good ear for tones. He gets his talent for designing game calls from his love to experiment and 33 years of laboratory experience. Give yourself the advantage of hunting with Carraway Calls and you will experience the excitement of hunting with wild game calls that really produce action. 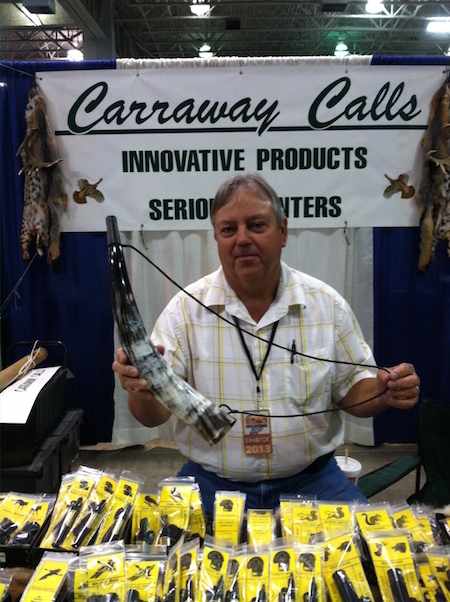 Carraway Calls have been used by ten's of thousands of serious hunters with great success for many years.